If you are watching your weight, cholesterol, or just your basic health, I advise against using butter regularly. The most saturated of all the animal fats, butter also contains the most cholesterol – more than twice that of beef fat. 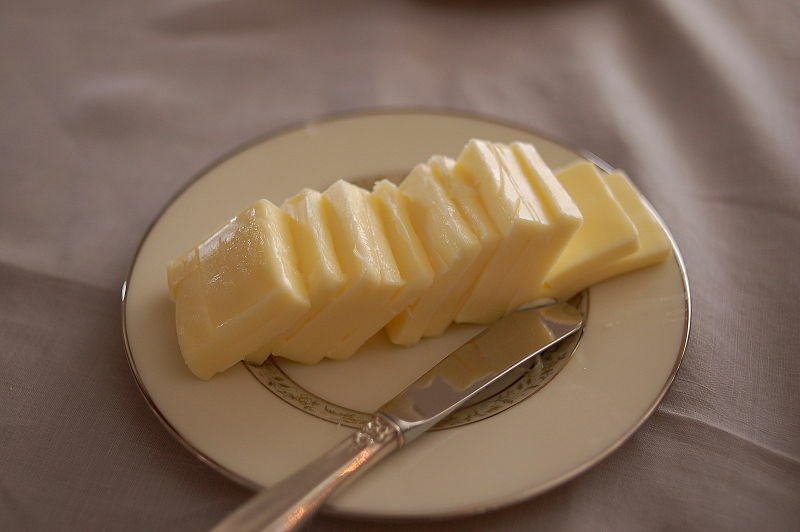 While butter is obviously not the healthiest choice, it remains a better choice than margarine, which is made from liquid vegetable oils that are artificially saturated (with hydrogen) to make them semi-solid. This process changes the fat molecules – making them capable of damaging arteries and raising the risk for heart attack. Instead of spreading your bread with butter or margarine, reach for the healthier monounsaturated fats found in olive oil and grapeseed oil, and dip a slice of your favorite loaf in it – you’ll be pleasantly surprised. Light brands of olive oil (which I use for most of my cooking) have less flavor, and grapeseed oil is neutral-flavored.